Take a look back at New Mexico's first cookbook with these classic recipes. Take a look back at New Mexico&apos;s first cookbook with these classic recipes. I’m fired up about a cookbook celebrating the best of New Mexico’s farms and orchards. It’s a slim book filled with big ideas for fresh New Mexico quinces, figs, and apples; free-range chickens grazed on piñon nuts; and vegetable salads in dressings spiked with vinegars fermented from New Mexico wines. 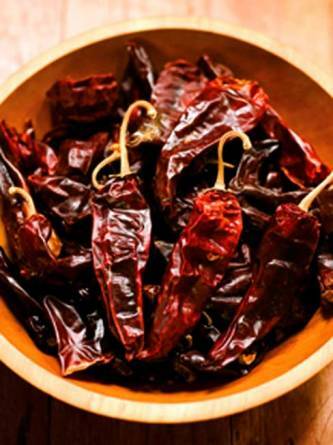 Of course, our state’s piquant chiles figure into many dishes, such as classic carne adovada, tender chunks of New Mexico pork braised in brick-red chile sauce. A tribute to New Mexico’s farm-to-table movement? Absolutamente. However, New Mexico Cookery, by Alice StevenssTipton, was published about a century before today’s efforts to support local growers and seasonal agriculture. As soon as New Mexico achieved statehood, in 1912, the Bureau of Publicity for the New Mexico State Land Office undertook ambitious plans for a cookbook. It was a bright scheme for its era, a volume that would chronicle the foods and dishes of the 47th state, instilling residents with a sense of pride in their heritage and agriculture, and enticing new settlers to put down roots here. In 1916, the Land Office published the remarkable tome, complete with color cover illustrating a ristra-draped ochre adobe with outdoor horno oven. Author Alice Stevens Tipton was a popular Santa Fe hostess of the era. She came to New Mexico from California with her husband, Will, a well-known surveyor, land inspector, and interpreter for the U.S. Court of Claims. From a vintage issue of the Santa Fe New Mexican newspaper, we know that both returned to her birthplace a few years after the book’s publication. In between, Tipton was a passionate and knowledgeable advocate for the foods and dishes of her adopted state. Cookbooks of Tipton’s era typically tried to look worldly, which was the case with one of the only other New Mexican cookbooks from the period around statehood, a 1911 Ladies’ Aid Society effort. In contrast to Tipton’s book, this one featured plenty of Eastern dishes, such as lobster Creole and all manner of fancy cakes, when few New Mexican households even had indoor ovens. It offered nothing of local origin. Chile, garlic, onions—all would have been considered too coarse or “ethnic” by most of the food authorities of the day. Bostonian Fanny Farmer, the country’s leading cookbook author, would have likely run from the table if served a bowl of green or red. In 1980, I stumbled onto The Original New Mexico Cookery in a cluttered Seña Plaza bookshop in Santa Fe. I had just moved here, and wanted to know everything I could about New Mexico’s food. Not until returning home and reviewing the book did I realize its timeless quality. What I had acquired was a beautifully bound reprint from a 1,000-copy print run done by Richard Polese in 1965. You can still find a few of the Polese editions around, especially in used bookstores and on websites, but Polese plans another reprint for the Centennial year. If you want a look at the original, one of the few remaining copies is in the New Mexico History Museum Library, in Santa Fe. It’ll make you hungry, as will these recipes inspired by the first New Mexico Cookery. Both recipes adapted from Tasting New Mexico: Recipes from 100 Years of Distinctive New Mexico Cooking (Museum of New Mexico Press, May 2012), by Cheryl Alters Jamison and Bill Jamison. Read more on Cheryl&apos;s blog. See more of Douglas Merriam’s work at www.douglasmerriam.com. was initially a way to preserve and prepare pork in the winter after hog butchering. Carne adovada, as it’s usually spelled today (originally carne adobada), was initially a way to preserve and prepare pork in the winter after hog butchering. Although we no longer have to preserve the meat as was the case a century ago, the hearty braise may still be best this time of year. Carne adovada can be presented on its own, or wrapped in a snowy flour tortilla as a burrito. Some like it as a filling for enchiladas, stuffed sopaipillas, empanadas, or even omelets. Preheat oven to 300 degrees. Grease a large, covered baking dish. Place pork in baking dish. and discard stems and most seeds. Place approximately half of chiles into a blender with one cup of stock or water. Purée until you have a smooth, thick liquid. Pour mixture into baking dish. Repeat with remaining pods and stock. Pour mixture into baking dish and stir sauce together with pork. Cover dish and bake at 300 degrees until pork is quite tender and sauce has cooked down, about three hours. If sauce seems watery, return dish to oven uncovered and bake for an additional 15 minutes, or as needed. Serve hot, garnished if you wish with lettuce and tomato. and look something like portly misshapen Golden Delicious apples. Quinces ripen in the late fall and look something like portly misshapen Golden Delicious apples. Find them through the winter months at farmers’ markets and larger supermarkets. Their fragrant, almost floral scent will fill your kitchen. Quinces must be cooked to enjoy them. 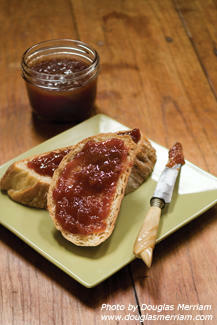 Quince butter, like apple butter, is a thick, jammy spread that’s great as a morning wake-up with buttered toast or yogurt. Later in the day, serve it with cheese, preferably a tangy New Mexico goat cheese or a Spanish Manchego. lice each quince (unpeeled) through core into eight pieces. Put quince pieces in a large saucepan and cover with water to just above fruit. Simmer over medium-low heat until soft, about 45 minutes. Much of water will have evaporated. Add a few more tablespoons of water if fruit begins to dry out before it is soft. Put fruit through a food mill to purée it, which will leave skins and core behind. Wash out saucepan that held quinces so that you can use pan again. Measure quince purée and spoon it back into pan. Add one cup of sugar per two cups of quince purée. 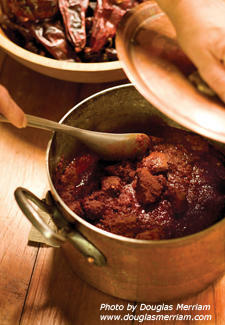 Return to medium-low heat and continue cooking, stirring frequently, until very thick and jammy. Add zest and juice of orange, cooking another minute.